The Eurovision Song Contest may focus on the music, but the presentation of the three-minute wonders are built around visuals as well as the audio. In ‘Every Song A Story‘ Ewan Spence and ESC Insight explore the art of visual presentation at the Song Contest through video essays and practical examples. (Inspired by and with thanks to Tony Zhou’s ‘Every Frame A Painting‘). From West Wing and Katrina and the Waves, to Mad Men and Mans Zelmerlow, how has the Eurovision Song Contest adopted the lessons of cinematic television? Ewan Spence explores the new rules in the latest episode of Every Song a Story. The Eurovision Song Contest is as much about the presentation as it is the music. 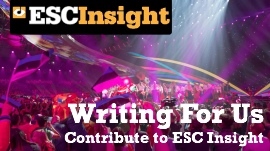 Every Song A Story is ESC Insight's collection of video essays exploring the visual world of the Song Contest. In this episode, Ewan Spence explores the impact of the music video on the Contest. 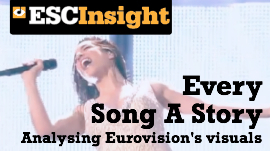 In the concluding 'Every Song A Story' video essay, Ewan looks at themes and symbols that can be repeated throughout Eurovision, both on stage, and in the official promotional videos. How can a delegation increase connections and emotions with the audience in the three minutes on stage, and in the weeks beforehand? If there's one man who can create stunning visual images on the screen, it's Michael Bay. But can the cinematic lessons of Bayhem apply to the Eurovision Song Contest? Ewan investigates in the next video essay from 'Every Song A Story'. With examples stretching from 2014 right back to 1959, this week's 'Every Song A Story' video essay looks at framing a Eurovision performance . How do you film the classic stories of boy meets girl, boy leaves girl, girl decides they need to get back together, boy tries to run away, and beyond?